Reports of the Apple-owned Beats gearing up to launch its own take on the AirPods concept surfaced in late March, following the announcement of a second-generation model of AirPods. While there have been rumors and leaks, including images and an animation buried in iOS 12.2, Apple has yet to officially confirm the existence of the product. 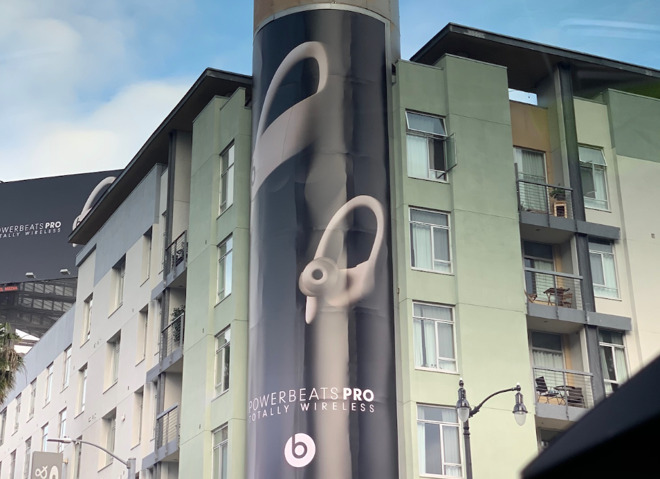 Advertising for the Powerbeats Pro has been spotted in the intersection of Sunset and Vine in Hollywood, consisting of a vertical banner on the corner of a building as well as a more traditional billboard. Both marketing images showcase the lighter-colored version of the earphones on a dark background, while the text simply declares it as "Totally wireless." Largely based around the design of the Powerbeats3, the Powerbeats Pro is pretty similar in overall concept to the AirPods, in being two separate earpieces that connect via Bluetooth, without requiring a connecting cord between the two sections as used by many Bluetooth headphones. It is likely the accessories will use the H1 chip, introduced in the second-generation AirPods to provide a more power-efficient operation and new features like "Hey Siri" support. It is probable some potential AirPods users will be drawn to the Powerbeats Pro due to being more suited for fitness applications. The use of earhooks instead of relying on buds fitting snuggly in the ear canal is likely to make them more secure to wear during sports or fast movements. A release date for the Powerbeats Pro has yet to be confirmed, but the appearance in iOS 12.2 and advertising suggests a launch will be happening soon. The advertising was first reported by 9to5Mac, spotted by a reader identified as "Jonathan."